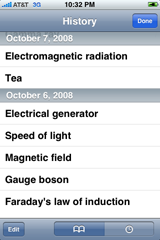 Wikipanion's custom formatting for the iPhone formats each page so that it is easy to read and quick to load. With a direct connection to the Wikipedia servers, pages load several times faster than when viewed from Safari. Double tap to zoom in and out of the page. It also has complicated algorithms to display tables, size images and scale TeX equations for easier viewing. Search Wikipedia while you type with the quick and smart autocompletion, helping you find your requested topic quickly and accurately. Additionally, a short page summary appears with each entry to further assist you in finding the exact entry for which you are looking. But that's not all. If you don't find what you're looking for, easily retry your searching using another search engine: Google or a comprehensive full-text Wikipedia search. But searching doesn't stop at finding the right page. Wikipanion helps you find the exact information you need through its in-page search functionality. Search for a term and easily skip forward and backwards through the search results. Wikipanion is designed for users from around the world. That's why it not only supports setting a default search language, but also letting you choose a set of additional languages for searching. 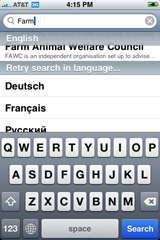 Then when you search and don't find what you want in your default (or currently viewing) language, you can retry the query in a different language. You can also choose to search simultaneously in both the current page's language and your default search language. Класно! Because Wikipedia doesn't just display the page, but understands it, it will only show the other page languages available from your language settings. Because why scroll through a bunch of languages like Walon and Uyghur when you only want to see Cymraeg, Hrvatski and Shqip? Wikipanion knows where you've been and lets you go back, keeping the last 100 visited entries for your easy perusal. No worries — you can reset your history and page caching easily in the iPhone settings program. Then, next time you launch Wikipanion, all of your history will be magically erased. supports bookmarking all of your favorite Wikipedia pages. Because only you know where you want to visit again. Bookmark all of your favorite pages, or just store certain ones to read later. Wikipanion handily shows the download status of pages in the bookmarks and history view, as well as the saved pages view, so you can know exactly what is saved onto your iPhone. Bookmarks and saved pages are stored in separate lists so that you can easily bookmarks dynamic page without having to save static copies of them. Quickly delete entries in any of the lists by swiping your finger from the left to the right over the entry you wish to delete, and then hit the delete button. It's excellent! Interactively resize the font size to whatever you please right in the interface. With access to a continuous range of font sizes, you'll be able to set the point size to exactly what you need. But Wikipanion is even smarter: there's no need to continually set the font size on each page you read: the last font adjustments are remembered so that you can set it and forget it. Lookup terms in Wiktionary quickly without leaving the current page. 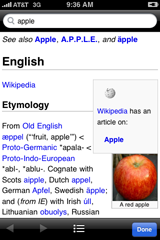 In fact you can continue your Wiktionary browsing without changing Wikipedia pages. 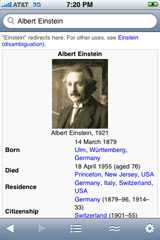 Providing the same great page rendering and table of contents browsing, Wikipanion gives you a unified Wiki-experience. Wikipanion supports playback of ogg vorbis formatted audio, thus allowing you to hear all of the available pronunciations on Wiktionary. The audio experience doesn't just stop at dictionary definitions, however. Listen to great audio files like Beethoven's Moonlight Sonata, directly from Wikipedia. Sometimes you just need to prove something to someone. Wikipanion includes a handy "e-mail link" feature accessible through the current topic actions sheet for quickly e-mailing of a Wikipedia link to a friend, a link that not only links to the current page, but also the current section you are reading within the page. Wikipanion also provides a custom image viewer that supports saving the full sized image directly to your photo library (gif, png and jpeg are supported; svg is not due to iPhone limitations). Just click the image and the image saving will happen in the background while you browse. 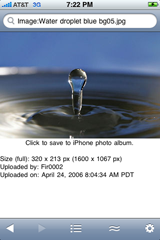 The viewer also shows additional image metadata when available, such as what camera and camera settings were used to take the photo, as well as the original image size. 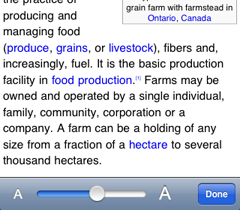 Wikipanion for the iPad provides custom formatting, displaying Wikipedia articles with beauty and style. You choose whether you want serif fonts for grace and elegance, or sans-serif fonts for efficiency and discernability. Rotating the iPad to landscape mode provides a convenient table of contents that tracks and updates as you navigate through the page. Easily see your bookmarks and history, and navigate between different language versions of the article. Smart autocompletion provides search terms as you type, along with a short summary of each article so you can pinpoint exactly what you need. 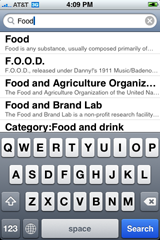 In case you can't find any results, try the built in Google search or a more comprehensive full-text Wikipedia search. With so many search options, there's no limit to the amount of information you can gather. Searching doesn't stop at finding the right article. Wikipanion also allows you to easily search an entire page's contents for a specific word or phrase, just like a normal desktop web browser. Then navigate quickly through all of the results through an easy to use touch interface. Wikipanion provides many forms of location based searching: it can detect locations embedded within articles in order for you to easily search for other articles geographically located near the article you are reading. Or search for articles that are near your current location. It's information about the world at your fingertips. Wikipedia speaks many languages, and so does Wikipanion. 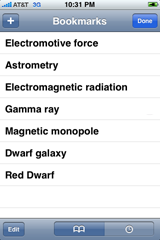 Not only is the interface in over 16 languages, but you can select from a long list of Wikipedia's languages. Enable only the ones you need so that you can easily switch between the languages you care about. Wikipanion can even perform a dual language search, searching two languages for a single search term. Lookup terms in Wiktionary without leaving the current page. Define words within the page. Wikipanion is the only mobile Wikipedia client for the iPhone that supports ogg vorbis formatted audio, which means you can listen to all of the available pronounciations on Wiktionary. However the audio experience doesn't just stop at definitions, but includes great audio content like Beethoven's Moonlight Sonata, directly from Wikipedia. Wikipanion allows you to easily share entries with others. You can e-mail links from within the application, or tweet a link via a Twitter app. You can copy the current page's url to paste somewhere else, and save images directly to your photo library (gif, png and jpeg are supported, svg is not due to iPhone's photo library limitations).